Amazon is releasing Fire TV update 5.0.4 for Generation 2 Fire TV that will allow shortcuts for sideloaded apps to appear under the Apps menu on homescreen. 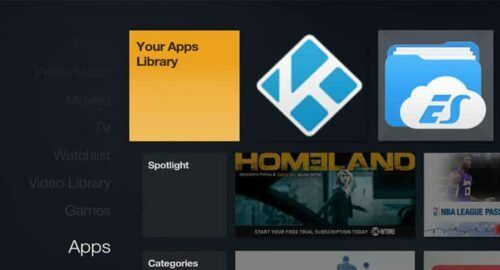 So Kodi and other sideloaded apps can now be easily launched from the “Apps” section. However, the shortcut still does not appear under the “Recent” section which would be the easiest place to launch Kodi from, if you a frequent Kodi user. Gen 1 Fire TVs are expected to get this update in January 2016 or a bit later. We have shown you how to create Kodi shortcut on Fire TV using adbFire and LLama (which currently works on Gen 1 only) as well as using FireStarter to simplify launching sideloaded apps (works on both Gen 1 and Gen 2). This update now provides a third option for Users that are not comfortable modding the default functioning of the Fire TV. Because, this update still requires you to go to Apps section (several clicks) to launch Kodi, I still recommend using Starter.